In this recipe the melted cheese acquires a new seasoning with the addition of the mushrooms. 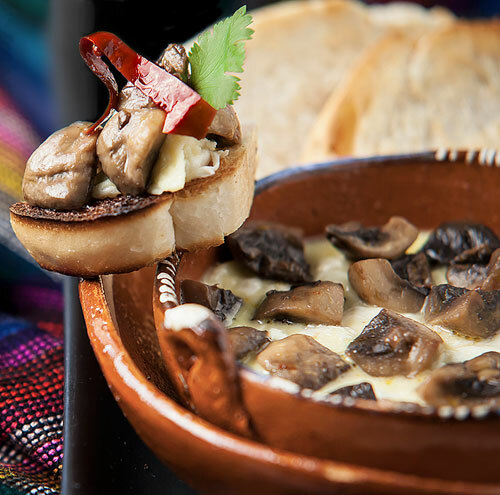 In this combination the soft flavor of the cheese is complemented with the delicate and wild flavor of the mushrooms – making this dish spectacular. The melted cheese with mushrooms is perfect to serve it as entree dish , which can be placed on the center of the table so everybody can enjoy its exquisite flavor. If you want to serve it as main course is also possible and it is excellent for vegetarians. In Mexico is beautiful to see how this dish is served because when it gets to the table the cheese is still bubbling because it is so hot . Moreover the dish is accompanied with flour tortillas to make some kind of tacos or quesadillas. Try it this way you will love it! In this recipe very simple activities will be performed, you won’t have any problem. It is very important to use a cheese that melts. We recommend using the Chihuahua cheese, Monterey Jack cheese, Asadero cheese, etc. If the cheese is bought grated you will save a step. Make the cheese look 100% Mexican by serving it in a small clay cazuela. The cheese will be ready in 20 minutes . Clean 4.4 oz of mushrooms. Cut into strips the mushrooms that were cleaned, then reserve. Mix the frying pan ingredients and fry them for about 3 minutes, until the mushrooms are lightly fried; stir regularly. Then set aside. Transfer from the frying pan to the baking dish, with a slotted spoon, the mushrooms that were fried. Tip: If you want to give a special touch and slightly spicy to the dish, put some fried guajillo pepper rings over the melted cheese. Variations: The melted cheese can also be prepared with chorizo , with peppers , natural , etc. Control the quantity of oil that you use and consume less fat with the “Misto Gourmet Olive Oil Sprayer". You can refill this bottle as many times as you want, it will help you saving money and it is an excellent seasoning tool. Heat your tortillas on the “Lodge Logic Griddle". Thanks to its exceptional heat retention and distribution your Mexican food will always be heated to perfection. If you need kitchen utensils, buy this beautiful set of utensils; which are made of bamboo and they are very resistant.